French tosafist of the second half of the twelfth century. He was a pupil of R. Jacob b. Meïr (Tam), with whom he discussed legal questions. 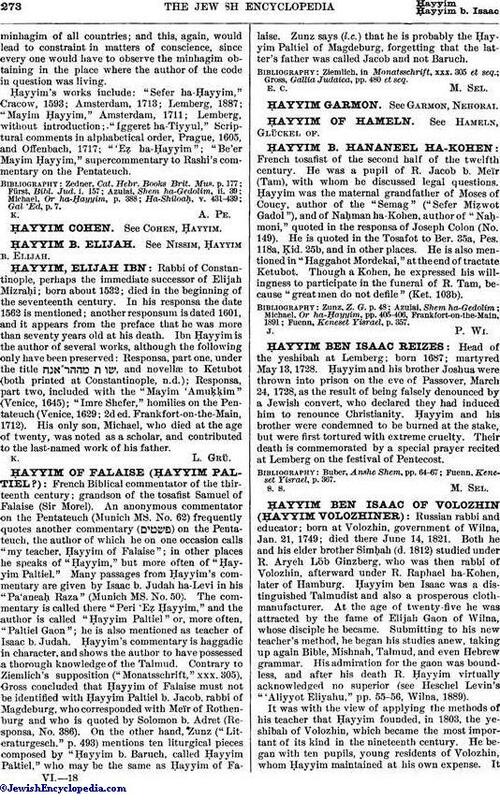 Ḥayyim was the maternal grandfather of Moses of Coucy, author of the "Semag" ("Sefer Miẓwot Gadol"), and of Naḥman ha-Kohen, author of "Naḥmoni," quoted in the responsa of Joseph Colon (No. 149). He is quoted in the Tosafot to Ber. 35a, Pes. 118a, Ḳid. 25b, and in other places. He is also mentioned in "Haggahot Mordekai," at the end of tractate Ketubot. Though a Kohen, he expressed his willingness to participate in the funeral of R. Tam, because "great men do not defile" (Ket. 103b). Fuenn, Keneset Yisrael, p. 357.